Miron Construction will once again exhibit at the POWER-GEN International conference, coming up on Dec. 4 through Dec. 6. in Orlando. POWER-GEN International is a power generation event with content for all forms of energy. The topics and trends focus on technology, innovation and policy advancements. Miron’s 100-year history has given us a strong foundation for and intimate knowledge of how to successfully deliver complex projects. Miron has invested the time and technologies necessary to train and equip our staff to deliver a wide range of energy and infrastructure projects including conventional power generation, gas and oil, waste-to-energy, and biogas facilities. Our team understands the unique demands facing this industry. 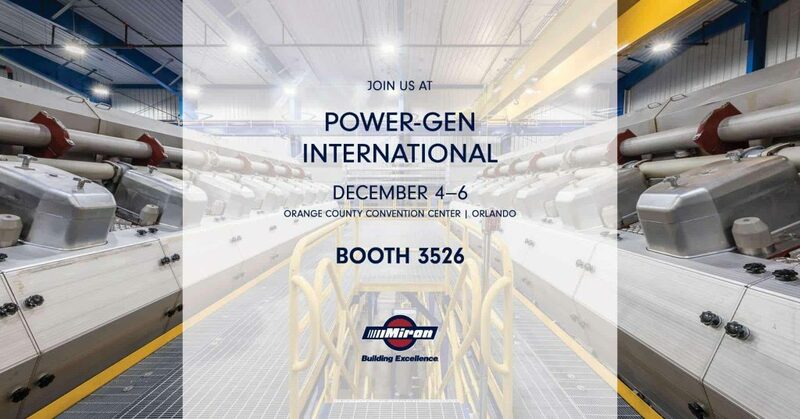 POWER-GEN International will take place at the Orange County Convention Center in Orlando, and conference hours are Tuesday, Dec. 4 from 730 a.m. – 8 p.m., Wednesday, Dec. 5 from 7 a.m. – 5 p.m., and Thursday, Dec. 6 from 7 a.m. – 1 p.m. Come see us at booth #3526!